The Reasoning PowerPoint App makes diagrammatic mapping easy in PowerPoint. The App is built on top of SmartArt. It incorporates both the CASE schema and the “ABC” (Argument, Bridge, Contention) schema. It is the tool used in a range of online offerings launched in 2016. The CASE Word App is an add-in for Microsoft Word supporting argument mapping within Word documents. It is based on the CASE (Contention, Argument, Evidence, Source) argument mapping template. YourView is a virtual forum where Australians can express their views on major public issues. Uniquely, YourView is able to determine the collective wisdom of the participants. For more information about YourView see this page. 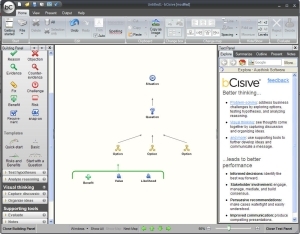 An argument mapping add-in for Microsoft Word.